I have been stuck in a 3.1 mile rut for a while now. I have gotten a little faster but I haven't been progressing in terms of distance the way that I want to. The Couch-2-5k program got me started with running but after I finished with that I just started winging it. It has not really worked. I need a new goal to work toward so I decided to start working through the Hal Higdon beginner 10k training plan. I started the program yesterday and Mondays are supposed to be stretch and strength days so I did an hour long beginning kettlebell workout. I wore my Garmin with the GPS turned off so that I could track my heart rate and calories burned. Compared to the 30 Day Shred this workout was slow and low intensity. 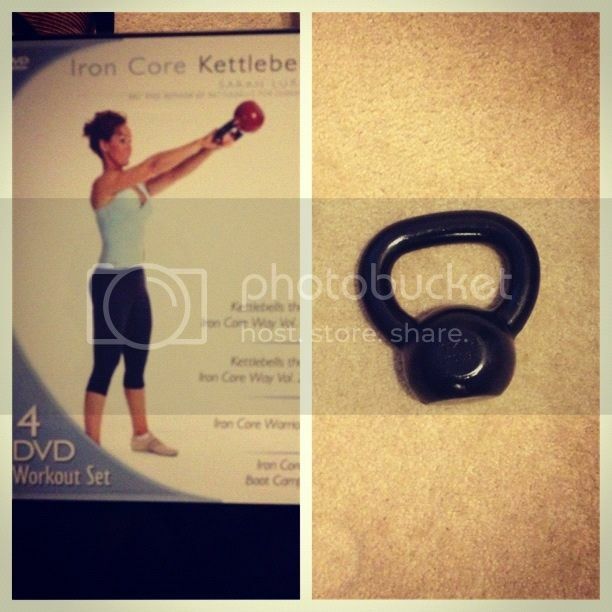 There's not a lot I can do about the slow part, but I think after I get the kettlebell basics down I will move up to a heavier kettlebell so that the workouts are more challenging. For now I'm going to alternate the 30 Day Shred tape and the kettlebell workouts. Hopefully between the two workouts I will get in a fair amount of strength training each week. The plan calls for a 2.5 mile run for the first three Tuesdays and a 3 mile run for the last 5 weeks. Since I have been consistently running 3 miles anyway I think I will bump those first three Tuesday runs up to 3 miles. If I was just trying to build up to running 10k I would follow the program strictly, but I am trying to lose weight and build up my mileage. Running around 10 miles per week helped me break through my recent weight loss plateau so I don't want to stray too far from that number while I follow this plan.